This is one of those post where there are so many things to talk about that it would be almost worth writing two. On the other hand that would not be right as all these things have happened in one day so, trying to be brief, I’ll put them all here. Hostel was great and my surfers/party-going room mates were not there or gone for the count so I had a great night. I think on the basis of these first nights in Spain I think the accommodation for now puts Spain at the top of the pile of the countries done so far. I left early and I got quite depressed as it took me an hour to do the first four miles. 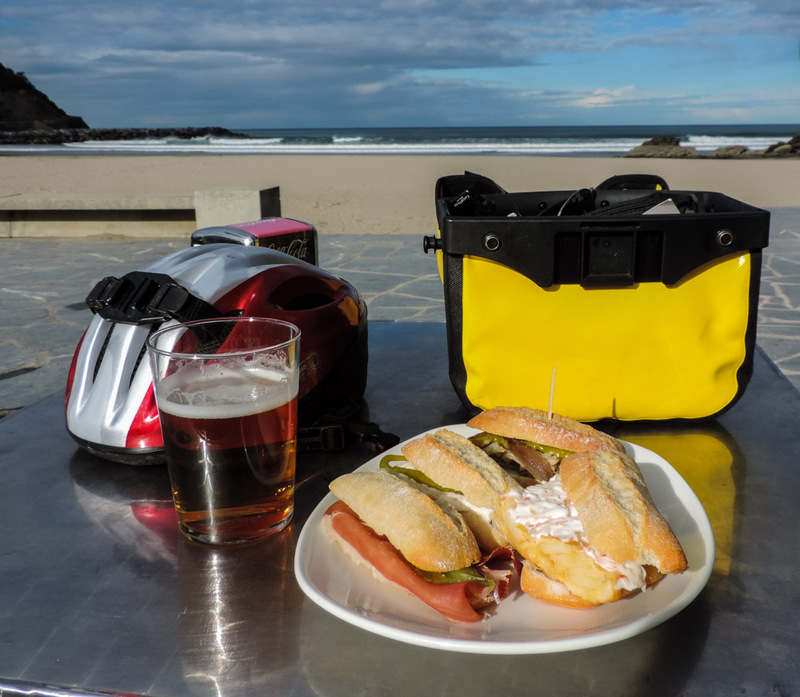 Getting out of Donostia [San Sebastian] is a climbing exercise. Nonetheless I had not booked any accommodation for tonight by then so I had nothing to worry about, other than spending three months to cross Spain. I made it to the outskirts but not without loosing my tracks a time or two. Sometime it feels like the road to nowhere. On the right path and quite hungry I got into a bar in Lasarte-Oria and ordered a coffee and a pastry. 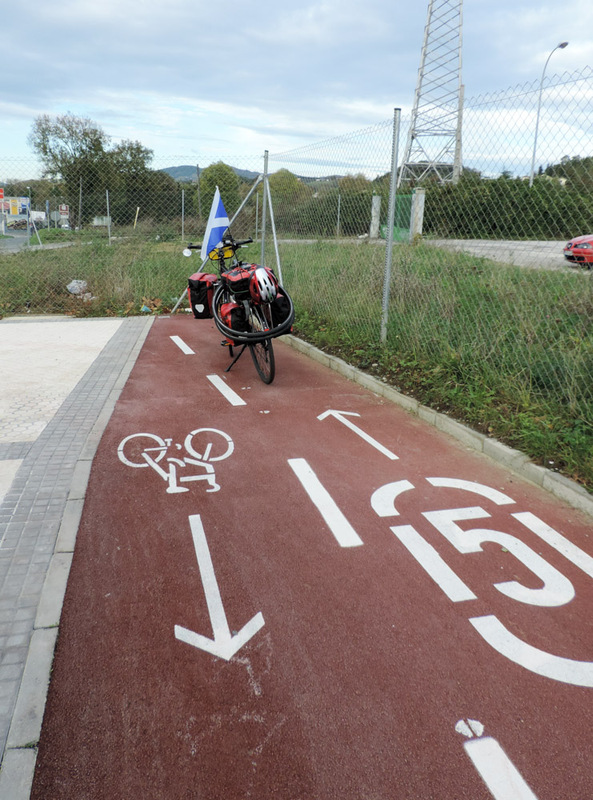 While I was just about to tuck into my food, a chap along the bar asked me what flag was on my bike just outside and got very excited when I told him that, not only that was a Scottish flag, but that I had just cycled here from Glasgow. We spoke a little about my route from Glasgow and my route on from here. I gave him one of my cards and he showed me on the map all the places he had been. He, and his partner were very nice and seemed to cope well with my Spanish. After they left I had my food and drink and when I took the wallet out the bar tender insisted that he was going to offer it to me as he had been so amazed by the recollection of my plan. Now I have to admit that I have had mixed feeling about Spanish people since I was a school child. Not really sure what created it, but I suspect ignorance plaid a star role in keeping it alive. Anyways this morning encounter cured all that. See, you french, was a coffee too much to ask? Sometimes I feel like I always take pictures of the bicycle. After that, refreshed in the boy and, more importantly, in the spirit I moved along and, shortly after this picture above was taken, my short career as a road code criminal came to an end. I was going through Zarautz and I saw in the distance two policemen on motorbikes. My helmet was nicely hanging from the back rack an not sitting on the top of my head. The first policeman slowed down and pointed at it and then pointed at his head. I thought for a moment about playing dumb and perhaps doing the brit-abroad thing of “TAL-KING-VE-RY-SLOW-BUT-VE-RY-LOUD-LY-IN-EN-GL-ISH” and expecting that this would be just as good as the local language. In the end I resolved not to be funny and I just stopped and wore the damn thing. As a side benefit of the helmet though comes the capacity of mounting the GoPro camera so I took some footage of the coast. I have to say though that, while I still have limited experience I think the quality of the filming with the post mount cannot be matched by the head mount. 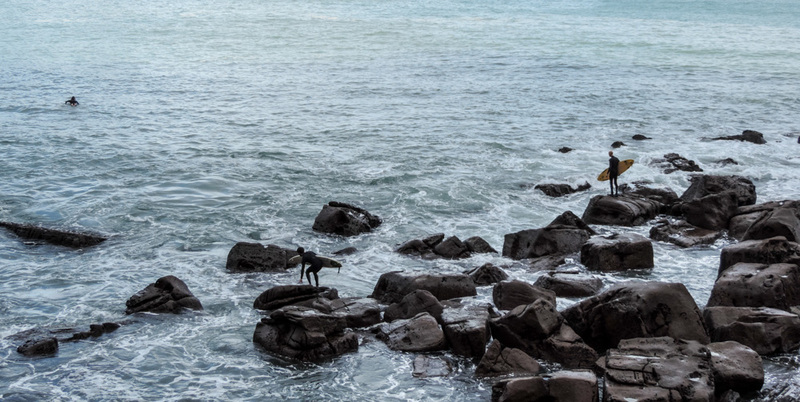 It was lucky filming, the scenery was breathtaking and the weather was good. I do wonder though what goes on in surfer’s heads? There were some very accessible and nice beaches near the spot where I took the picture below, are they trying to kill themselves? I had become more confident about my progress by then, building up to a ten MpH, and I was confident I was going to get to my chosen destination for the night. I booked the accommodation and I kept going aiming for Deba where I was going to leave the Atlantic Ocean and start the great Spain crossing. I got into Deba in good time, and I decided to get something to eat being that I had by then only another fifteen to twenty miles to go. The bar on the playa had tables outside and the usual extraordinary selection of offering on the bar, sun sea beer and food meant I spent a good twenty minutes away from the saddle. Temperature was in the low twenties but my legs in the cycling lycra were getting quite warm so I decided to move on, but not before I took a picture of the murales on the beach wall. All through the day I had people leaning out of the car windows screaming “Go Scotland” or, sometime “fuerza escocia”. 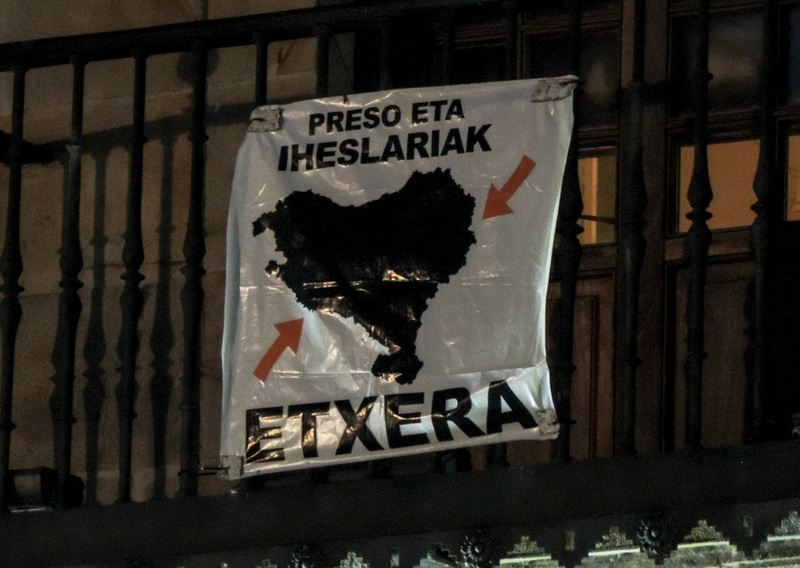 It seems to me that if Alex Salmond had extended the franchise of the referendum to the Basque country there would have been a different result in September. 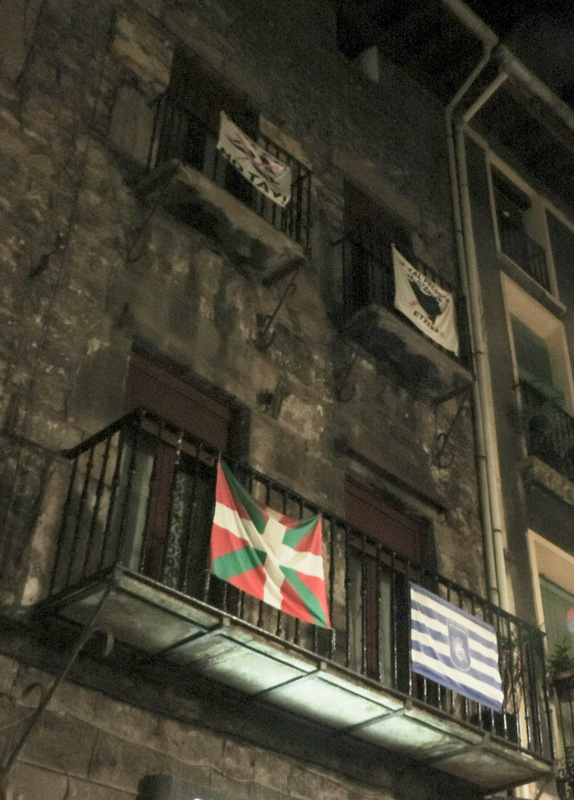 So flying a Scottish flag is now not only popular in France (Brittany) but also in the Basque region. I wonder how it will get received when I get in Spain proper. Nobody is shy about their patriotism. You do not have to go searching too hard to find sign of the independence movement. 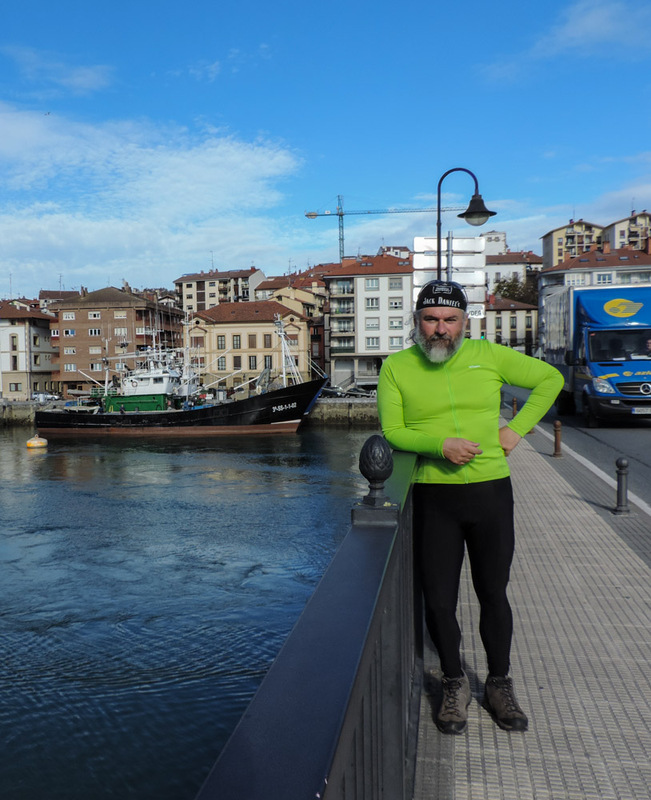 I got into Bergara with an hour or so of light but, between washing and taking to my folks I did not get out before sundown. It was still quite good photograph weather so I took a few shots that are quite telling about this area and the big issue that engulfs it. This on a public building. I do wonder sometime what is the benefit in protecting one tradition, state unity, when the call for the protection of a different tradition, independence, is felt so strongly. The final picture is for me very telling. 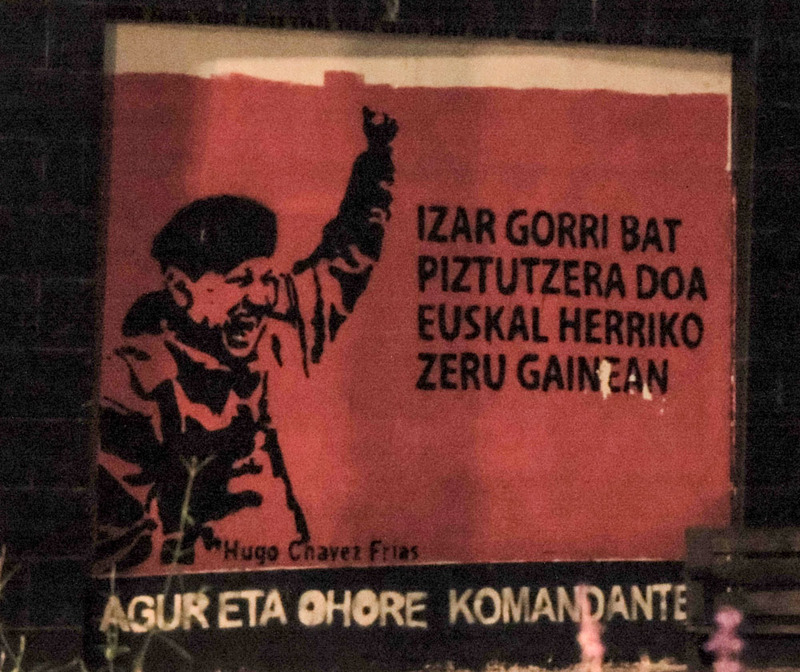 Hugo Chavez was the standard bearer of the traditional marxist left, and it seems to me as if there was a clear emotional link between the Basque independence movement and this kind of left. Quite curiously, if the concept of left and right still had some meaningful value in today’s political landscape, I would also put the Scottish National Party in the left spectrum of politics. The sky was bright with a red star in the Basque Country . Hail commander Chavez. Previous Post Hola que tal? Che meraviglia il mare!!! Qui piove a dirotto. Notte. …ops!…sorry!! I had not seen the video at the end of the post!…damned smartphones! Insomma solo qui il casco rimane a discrezione del ciclista!